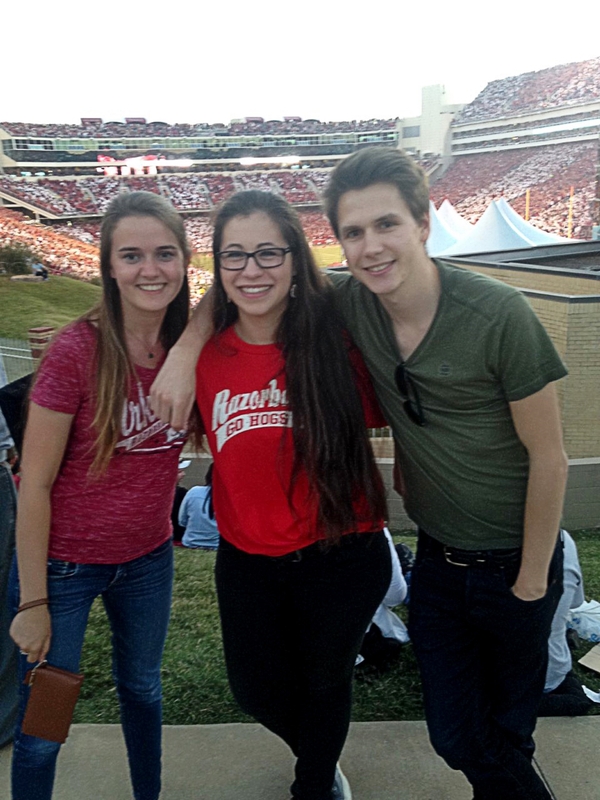 From left, Emma Maetens, Eva Dehaene and Flor Maes, all Bumpers College food science students from Ghent University in Belgium, at a Razorback football game last fall. FAYETTEVILLE, Ark. – The U of A Department of Food Science is tied for first in the nation in scholarly research and is consistently in Academic Analytics Database's top five, so it's no surprise students want to take advantage of research opportunities. The quality of research is valued in the U.S. and around the world, and many international students complete food science projects in Fayetteville. Ghent University in Belgium is a top 100 university in the European Union, and food science and nutrition students have been travelling to the U of A for more than a decade to conduct research. Academic Analytics Database includes information on more than 270,000 faculty with more than 9,000 doctoral programs and 10,000 departments at more than 385 universities around the world. Discipline-by-discipline comparisons are made in areas of publication of scholarly work as books or journal articles, citations to published journal articles, research funding by federal agencies and honorific awards for faculty members. The food science program in the Dale Bumpers College of Agricultural, Food and Life Sciences is tied for first in the nation with the University of Massachusetts with an AAD Scholarly Research Index rating of 0.9. Eva Dehaene, Emma Maetens and Flor Maes, all students at UGhent, completed food science projects in Bumpers College last year. Dehaene completed her nutrition thesis research at the U of A with assistant professor of nutrition Jamie Baum in collaboration with John Van Camp, her Ghent adviser and professor. Her project was to determine the effects of omega-3 fatty acid consumption on energy metabolism and appetite in normal weight and overweight/obese young women. They found omega-3 fatty acids can decrease hunger and increase post-meal calories burned following one meal. Dehaene defended her thesis last summer in Ghent and Baum was cited as her co-adviser. "I am really happy I took this opportunity to perform my thesis project at the University of Arkansas," said Dehaene. "I met great people and gained so much knowledge in a lot of different ways. I would make the same decision all over again. The professors I met were great and I always felt so welcome at the Department of Food Science. It was a great experience and I am really thankful for everything I got to do and see during my stay." Maetens completed her master's thesis work, working with University Professor Navam Hettiarachchy. Her project focused on the quality and functional food value of a new soy snack food. After defending her thesis, she is now working with Pfizer in Belgium and her work has been published in Food Science and Technology. "The University of Arkansas is an amazing place to stay," said Maetens. "Everything worked out very well. I was very proud with the results of my thesis. The staff and students are very friendly. I learned so many things that helped me both to finish my studies and for life in general." Maes worked with Kristen Gibson, associate professor of food safety. The research objective was to evaluate the susceptibility of various human norovirus genotypes to treatment in suspension with the household disinfectant bleach. The work was presented at the International Association for Food Protection Annual Meeting in Tampa, Florida in July and is being prepared for peer-reviewed publication. "I had a great time studying abroad," said Maes. "There is a lot of initiative from the university itself to help you along. The professors, as well as the other students, really put in effort to help you fit in. People are very open so you end up making friends really fast." The Department of Food Science began collaborating with UGhent in 2005, initially for student exchange research experiences funded through EU and U.S. Department of Education federal EU-US grants with UGhent professor Roland Verhé. Now Koen Dewettinck, an adjunct professor with Bumpers College, provides leadership and funding at UGhent for their students to conduct research at the U of A. Bumpers College students are encouraged to engage in study abroad that will lead to life-long partnerships, cultural awareness and understanding of the global dimensions of their majors. The college's International Programs Office provides structured international experiences that enhance the marketability of students for career and academic opportunities through faculty driven, sustainable initiatives. The office supports faculty, students, international partners and university leadership in increasing opportunities for students to engage in faculty-led programs, internships, exchange programs, and study abroad activities that include research. The college sponsors exchange programs to Austria and France, along with faculty-led programs in Belgium, India, Italy, Mozambique, New Zealand and Australia; internships in Greece and Scotland; and research opportunities in Brazil and the Philippines, and Greece. Go to the Bumpers international program and study abroad website for more information.